If you are able to make Wednesday’s session, at NGA Headquarters, you’ll hear Sue Gordon, Principal Deputy Director of National Intelligence, kick off the TS/SCI day with a keynote, followed by several in-depth threat briefs from the leadership of the National Intelligence Council. Full agenda is here, and you can read here more about the Classified Day overall, including last-minute directions if you can make it and we still let you in! I have a great new job, allowing me to spend several weeks recently in the center of the universe, and I’m loving it. I’m going to spend even more time there from now on. By that I mean Palo Alto, Silicon Valley’s capital and VMware HQ, where I am now Senior Director, National Technology Strategy, working primarily with the R&D team. But I can’t help putting that “Valley capital” term in a bit of historical context. Back in ancient times (late ’80s-early ’90s) when I worked for the Mayor of San Jose, S. J. City Hall was dealing with a bit of civic insecurity. Although San Jose’s population was already larger than San Francisco and now the tenth largest city in the country, our mayor (my boss Tom McEnery, the first government leader ever elected to the Silicon Valley Business Hall of Fame) believed that we needed to brand the city explicitly as “The Capital of Silicon Valley.” So that became a multi-million-dollar marketing campaign, and we punched the message home every chance we got. Yet as the mayor’s policy adviser and speechwriter, I laughed each time I used the phrase. I had just moved to San Jose from Palo Alto, where I got a graduate degree at Stanford. Just twenty miles up Highway 101, Palo Alto had much better claim to being the center of the geographically hazy electronics domain. I knew the arguments we used in San Jose (see here for example). But I also had already met Bill Hewlett and Dave Packard in person in Palo Alto, and ha d walked many times on the sidewalk by the legendary garage at 367 Addison where HP was born in the late 1930s; and I had also seen a different historic marker four blocks from the garage, at the corner of Channing and Emerson, commemorating Palo Alto’s very first electronics startup – Federal Telegraph Company, founded in 1909. It can be said that one of the cornerstones of Silicon Valley was laid when Varian Associates broke ground as Stanford Research Park’s first company in 1951. The Stanford Industrial Park, as it was first called, was the brainchild of Stanford University’s Provost and Dean of Engineering, Frederick Terman, who saw the potential of a University-affiliated business park that focused on research and development and generated income for the University and community. Dean Terman envisioned a new kind of collaboration, where Stanford University could join forces with industry and the City of Palo Alto to advance shared interests. He saw the Park’s potential to serve as a beacon for new, high-quality scientists and faculty, provide jobs for University graduates, and stimulate regional economic development. In the 1950s, leaders within the City of Palo Alto and Stanford University forged a seminal partnership by creating Stanford Research Park, agreeing to annex SRP lands into the City of Palo Alto to generate significant tax revenues for the County, City, and Palo Alto Unified School District. Throughout our history, an incredible number of breakthroughs have occurred in Stanford Research Park. Here, Varian developed the microwave tube, forming the basis for satellite technology and particle accelerators. Its spin-off, Varian Medical, developed radiation oncology treatments, medical devices and software for medical diagnostics. Steve Jobs founded NeXT Computer, breaking ground for the next generation of graphics and audio capabilities in personal computing. Hewlett-Packard developed electronic measuring instruments, leading to medical electronic equipment, instrumentation for chemical analysis, the mainframe computer, laser printers and hand-held calculators. At Xerox’s Palo Alto Research Center (PARC), innovations such as personal work stations, Ethernet cabling and the personal computer mouse were invented. Lockheed’s space and missile division developed critical components for the International Space Station. Mark Zuckerberg grew Facebook’s social networking platform from 20 million to 750 million people worldwide while its headquarters were in the Park. Today, Tesla’s electric vehicle and battery prototypes are developed and assembled here in its headquarters. Our largest tenant, VMware, continues to create the virtualization hardware and software solutions they pioneered, leading the world in cloud computing. With over 150 companies in 10 million square feet and 140 buildings, Stanford Research Park maintains a world-class reputation. In the summer of 2017, I got an email from a former Microsoft research colleague and one of the most eminent leaders in American technology R&D, David Tennenhouse. David has held key leadership roles in dream positions over the past quarter-century – everyone has wanted him on their team. He was Chief Scientist at DARPA; a research professor at MIT; President of Amazon’s R&D arm A9; VP & Director of Research at Intel; a senior leader in Microsoft’s Advanced Strategy and Research division. Smart companies have wooed him in serial fashion. Now David is VMware Chief Research Officer building and leading a stellar team, and over several months into 2018 we had some great conversations about where VMware had been and was going, and what I could bring to that journey. I had a chance to speak with several of the dozens of Ph.D.s he has been hiring to flesh out a comprehensive R&D agenda. I excitedly joined recently and we’ve been off to the races. It’s a sad, sad thing to lose a friend. To lose a good friend still in the prime of his life is tragic. Compounding it all, to lose a friend who has quietly been one of our nation’s most valuable national-security minds is just heartbreaking, on many, many levels. That’s how I feel now that Paul Kozemchak, longtime senior leader at DARPA and one hell of a guy, has passed away. The Washington Post ran a too-short obituary this week; I encourage you to read the full online tribute to Paul posted by his family, reflecting both his loving personality and his career’s breadth in service to the nation. I see from LinkedIn that one of his old endorsers there had simply written: “Paul knows more about the intelligence community that anyone else I know.” I could say the same thing, and I want to record a few personal thoughts and anecdotes. Several months ago I began spending time advising a small DoD element, the Strategic Capabilities Office. I was excited about the work, in large part because of what SCO does, but also because it meant I’d be spending a lot of time at DARPA headquarters just outside Washington DC, where SCO has offices. If you like me grew up idolizing the future-inventing wizards of DARPA, you can imagine the thrill I had getting a DARPA badge, and logging in with a personal account on the actual ARPANET. But that was only partly why I was stoked – it was mostly because I’d be able to see Paul Kozemchak frequently, or “PK” as everyone knew him. Paul has been working at DARPA for over a quarter of a century. I first met him over a decade ago while I was at DIA, and he was the well-established special advisor to the DARPA Director, and its liaison to the intelligence community. When I joined Microsoft’s Advanced Strategy and Research group in December 2007, I was delighted to invite senior government technologists to Redmond, for peek-behind-the-curtain visits to MSR labs and information-sharing on jointly-relevant research. Paul was the first person I invited, and that trip back to Redmond in the spring of 2008 was a blast. I got to know him better as a brilliantly incisive analyst, a laugh-a-minute wit, a bon vivant, an all-too-correct conspiracy theorist on world events, and most of all as a friend. Those short moments were all I was going to have. Paul was struck by a car as he was crossing that same street outside DARPA headquarters, on November 10. In the hospital, his family was with him a week later when he passed away. The memorial service is tomorrow. I mentioned PK on this blog way back in 2008 (right). In the ten years since there’ve been dinners, lunches, a million emails urbane or profane, late-night phone calls, several more trips together to the west coast, drinks on Capitol Hill… Others had the same experience, knew him longer or better, worked on more projects with him; Paul was extraordinarily popular in the euphemistic “certain circles” of DC. From 2011-2017 I had the pleasure of serving alongside Paul on Jim Clapper’s “Intelligence Community Strategic Studies Group,” the DNI in-house thinktank of outside advisors and former IC S&T folks now in industry. We carpooled to meetings sometimes. (Paul was a master at bumming rides to Metro, which stretched into front-door-of-DARPA delivery because he was always in the middle of a fascinating story.) The ICSSG performed classified studies on demand, as a kind of red-cell or alternative-analysis team, including one short effort I led to explore “The Future of Intelligence” – Paul was on my group for that, and every meeting was a richly rewarding seminar for me, learning from him. Paul has also been a longtime fixture in our AFCEA Intelligence Committee (I described that here), and since 2010 I’ve listened as he enlightened that elite body at its monthly meetings, typically sharing an unknown R&D advance (ours or theirs) with, “Here’s something this group should know.” It always was. I’m sad I’ll never again hear Paul ask another question, pose another challenge, solve another puzzle, make another joke. And the irony of having joined him in the DARPA building only to lose his friendship so quickly makes me even sadder. It has made me look up something I recalled from years ago reading Tip O’Neill’s autobiography. That legendary Speaker of the House, who popularized the line “All politics is local,” had early on memorized a poem, which he was fond of reciting in packed Boston pubs or meeting halls throughout his career. It’s about friendship and staying in touch with old friends. I’ll close with the poem, and the thought of seeing PK one last time. Today’s the anniversary of the 9/11 attacks on the American homeland, the sequence of events which wound up bringing me from Silicon Valley to Washington DC in 2002, and a stint working in the Intelligence Community. I notice today that no one asks me anymore, as they often did at first back then, why I was so intent on bridging the gap between DC and the Valley (broadly, not geographically, defined). Today it surprises few when we do something unorthodox like invite Amazon and Blue Origin founder Jeff Bezos to appear inside an intelligence agency earlier this year, for a probing one-on-one at the AFCEA Spring Intelligence Symposium with several hundred IC professionals about the rapid changes in technology, views on public/private collaboration, and the impacts of AI and robotics on his business and theirs. A short blog piece is not the place to examine fully this rich topic, but it is a good place to point out that I enjoy spending time helping all sides of this divide understand each other. By all sides, I mean government entities and officers (including intelligence and law enforcement), private-sector companies, and most importantly the public citizenry and customer base of those organizations. 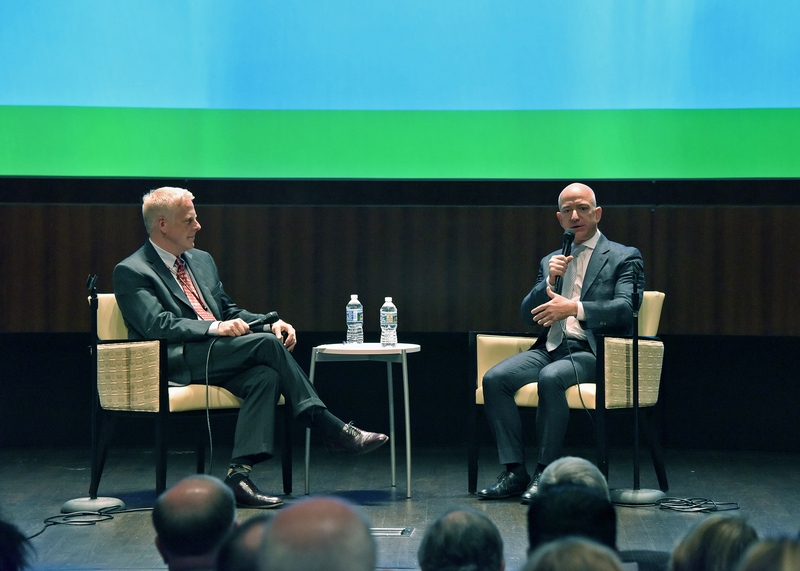 A great forum for doing that has been AFCEA, which this past week co-hosted with INSA the annual Intelligence and National Security Summit in DC. Along with helping oversee the agenda I had the opportunity to organize one of the panel sessions with my old friend (and former CIA Deputy Director of Intelligence) Carmen Medina. Our panel – very relevant to the above discussion – was on “The Role of Intelligence in the Future Threat Environment,” and our excellent participants addressed some gnarly problems. I tweeted many of the comments and observations (see my hashtagged feed here), and you can find more content and videos from all 15 sessions archived here. Your suggestions on new approaches to these dialogues are welcome as always. As we commemorate the horrific surprise attacks of 9/11/2001, in a rapidly changing world where real-time surveillance is performed by more and more entities, governmental and commercial, it is increasingly important to engage in thoughtful – and sometimes urgent – discussion about who watches whom, and why. Two years ago, the AFCEA Intelligence Committee (I’m a member) invited Elon Musk for a special off-the-record session at our annual classified Spring Intelligence Symposium. 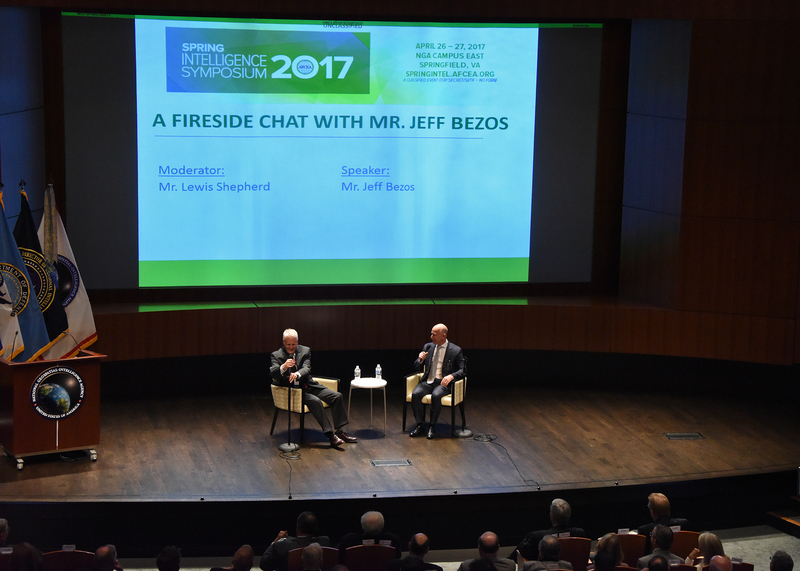 The Committee assigned me the task of conducting a wide-ranging on-stage conversation with him, going through a variety of topics, but we spent much of our time on artificial intelligence (AI) – and particularly artificial general intelligence (AGI, or “superintelligence”). There are four such projects listed, described as “problems which are not just interesting, but whose solutions matter.” Interested researchers are invited to apply for a position at OpenAI to work on the problem – and they’re all interesting, and could lead to consequential work. That reads to me like a classic “Indications & Warning” problem statement from the “other” non-AI world of intelligence. I&W (in the parlance of the business) is a process used by defense intelligence and the IC to detect indicators of potential threats while sufficient time still exists to counter those efforts. The doctrine of seeking advantage through warning is as old as the art of war; Sun Tzu called it “foreknowledge.” There are many I&W examples from the Cold War, from the overall analytic challenge (see a classic thesis “Anticipating Surprise“), and from specific domain challenge (see for example this 1978 CIA study, Top Secret but since declassified, on “Indications and Warning of Soviet Intentions to Use Chemical Weapons during a NATO-Warsaw Pact War“). The I&W concept has sequentially been transferred to new domains of intelligence like Space/Counter-Space (see the 2013 DoD “Joint Publication on Space Operations Doctrine,” which describes the “unique characteristics” of the space environment for conducting I&W, whether from orbit or in other forms), and of course since 9/11 the I&W approach has been applied intensely in counter-terrorist realms in defense and homeland security. It’s obvious Elon Musk and his OpenAI cohort believe that superintelligence is a problem worth watching. Elon’s newest company, the brain-machine-interface startup Neuralink, sets its core motivation as avoiding a future in which AGI outpaces simple human intelligence. So I’m staying abreast of indications of AGI progress. For the AGI domain I am tracking many sources through citations and published research (see OpenAI’s interesting list here), and watching for any mention of I&W monitoring attempts or results by others which meet the challenge of what OpenAI cites as solving “Problem #1.” So far, nothing of note. But I’ll keep a look out, so to speak. Understanding and forecasting that radical pace of external change is difficult for government professionals, and they need help doing that. Let’s say you wanted to tap someone to offer insight. Who’d be on your dream list? At the top of my dream list – my absolute “if-only-I-could-ask” list – would be Jeff Bezos, founder of Amazon and Blue Origin. The 2017 Symposium features, as usual, a stellar line-up of top leaders in national security, with panels on Advanced Conventional Threats, the Contested Environment of Space, Terrorism, Cyber Threats from Nation-States and Non-State Entities, and Gray-Zone Conflicts/Hybrid Warfare (topic of last year’s Defense Science Board study on which I sat). All sessions feature senior thought-leaders from government and industry. Jeff Bezos might be new in that particular mix, but you can understand why we invited him. He has been TIME Magazine’s Person of the Year (early in his career in 1999), Fortune Magazine’s Businessperson of the Year, topped the Forbes annual list of “World’s Greatest Leaders,” and our rationale for this conversation is his long track record of revolutionary contributions to international technological/economic advance, as well as to US national security. 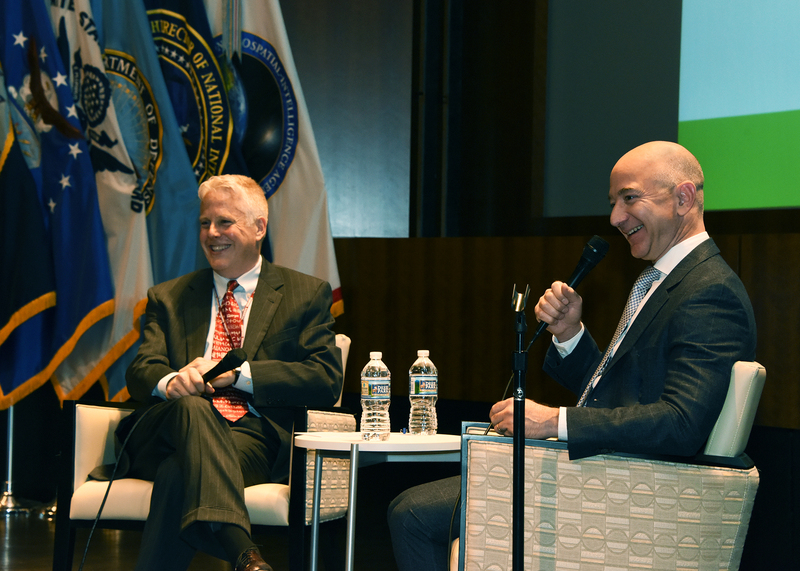 AWS is now of central importance to the public sector (including intelligence), and the broader contributions of Amazon and Blue Origin to the nation’s economic future and success are incalculable. There’s a longstanding meme that government should be “run like a business.” I typically don’t think in precisely those terms, having been on both sides and recognizing the significant differences in intent and stakeholders. But the “run government like a business” impetus is understandable here in the United States as a reflection of dissatisfaction with government performance in meeting its own goals, and the expectations of the citizens it serves. President Trump recently assigned Jared Kushner to lead a new White House Office of American Innovation, and Kushner told the Washington Post “We should have excellence in government. The government should be run like a great American company.” The Washington Post (coincidentally owned by, yes, Jeff Bezos) ran a piece exploring the history of that thinking, dating its surge in popularity to the early 1980s under President Reagan – a timeline borne out by running the phrase through Google’s Ngram Viewer (see chart).